Growing as a Baltic German in Canada, most of the people I met that came over as immigrants did so on ship, the Beaverbrae. After being captured by the Allies at the end of the war and came into to the possession of the War Assets Corporation. In November 1945 she was handed over to Great Britain as part of the War Reparations. Later in June 1947 she was allocated to Canada as part of this country's war reparations. After arriving in Montreal she was purchased by Canadian Pacific on September 2 1947 and renamed the Beaverbrae II. CP had a previous ship known as the Beaverbrae that had been sunk in March of 1941 by German Focke Wulf Condor bombers. 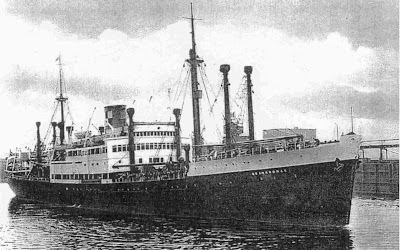 The Beaverbrae II was refitted in Sorel Quebec into a cargo liner of 9,034 gross tons with space for 773 passengers, 74 in cabins and 699 in dorms. The Commissioner of Immigration Arthur Jolliffe placed the Beaverbrae at the disposal of the Canadian Government and the Canadian Christian Council for the Resettlement of Refugees (CCCRR). The ship sailed about every 28 days with 773 passengers. In its service to the CCCRR, the Beaverbrae completed 52 voyages carrying a total of 33,259 passengers from Bremen, Germany, Rotterdam, Holland and Antwerp, Belgium to Halifax, St John or Quebec City, Canada.. Her final trip carrying people to Canada left Bremen on July 28th 1954. Both my parents and my aunt Nata Runge came over on the Beaverbrae. My grandmother Maria von Fersen, her two young sons and my cousin Charlie did not come on the Beaverbrae, but on the Arosa Kulm. The first job both my parents had in Canada was on the Beaverbrae as translators, so they were hard working immigrants before they even got off of the ship at Quebec City. They were both expected to do work on the ship to "pay" for their passage, this meant cleaning and cooking. My father sailed on her in 1951 leaving Bremerhaven on August 22nd and arriving in Quebec City on September 3rd. He spent the trip playing cards for money and winning. My father would have made a good professional poker player if he had any real desire to play for money. 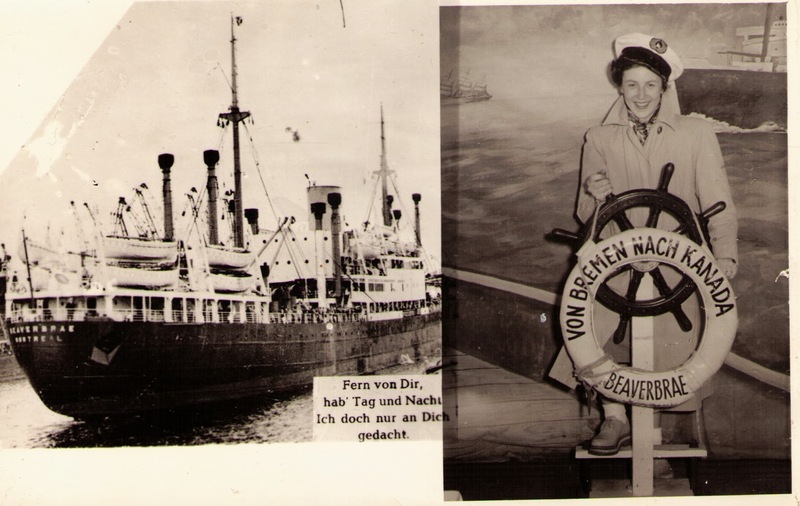 My mother sailed in August 1952 from Bremerhaven arriving in Quebec City on August 19th. Her trip was a non-stop party for her. As a 23 year old woman travelling on her own she spent most of the trip cavorting with the crew. My father sailed on the Beverbrae leaving Bremerhaven on August 7, 1952. Must have been on the same ship as your father. We have pictures of the ship with him and friends. My parents, my 2-year old brother and I, aged 6 landed in Quebec city in July 1952. Second day out from Bremen, my brother had to have his tonsils removed and two days before arriving in Canada, we survived 3 days and 2 nights of heavy storms that listed the Beaverbre and we had to sleep in life jackets. We waited in a huge warehouse for immigration all day in 90 degree heat and the Salavation Army gave us cold water, milk and cookies - true angels! Then we spent 4 days and nights on a train to my uncle's farm near Lethbridge, Alberta. Now I live with in Powell River with two other families that also came over on the same ship, two years after us, just before the Beaverbre was retired. Great country this Canada. I believe my parents and my oldest sibling settled in Western Canada via the Beaverbrae in the spring/summer of 1953. I am looking for a passenger list - would anyone have any resource suggestions for me? I believe my mother and father came to Canada via the Beaverbrae in 1953 - would anyone have any suggestions for finding passenger lists? Searches for the Beaverbrae passenger list have proven to be a no go as it is under the privacy act. Here is my reply from Immigration Canada.....In reply to your recent inquiry, I wish to advise you that Library and Archives Canada holds immigration records for the years 1865 to 1935. Records of immigrants arriving in Canada from 1 January 1936 to the present are in the custody of Citizenship and Immigration Canada (CIC). Those records are not available online due to privacy legislation. 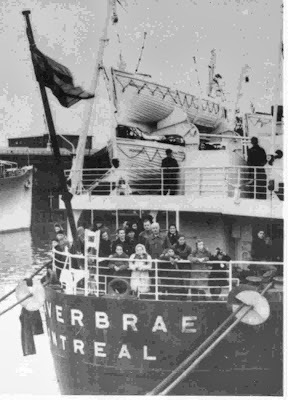 My parents came on the Beaverbrae arriving in Quebec on June 8, 1950. They were sponsored by a family in Cupar, Saskatchewan and worked on a large farm. 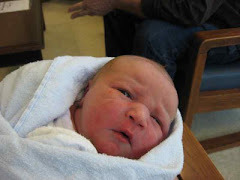 Big change for my Mom who handled the household - no electricity, lots of cooking, baking, gardening and preserving - plus a new baby (me) that fall. My Mom is now 90 and still talks about that voyage (very seasick) and the time in Cupar and has kept in touch with that family although they left in April 1951. Bethel Lutheran Church in Kitchener, Ontario will be hosting a second BEAVERBRAE REUNION on October 3, 2015. There was one in October 2010 and some images are online - Google Beaverbrae reunion. Very cool to see this. I was 3 months old when I came on this ship with my family to Canada. I once had a wooden replica of the ship but it was stolen when someone broke into my apartment decades ago. Much is about the organisation - Canadian Christian Council for the Resettlement of Refugees - part of Canadian Lutheran World Relief fonds. Many other church organisations involved in this effort. Not many lists, but there are some. Sadly not well organised - and on 31 films. I am still slogging through. Some photos on Library and Archives Canada website - www.bac-lac.gc.ca and search in the Archives section for photos.